SEND E-MAIL TO CONTRIBUTING AUTHORS! See link below to see pictures of counterfeit relics. 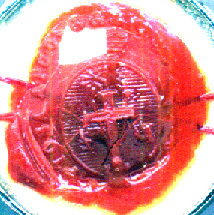 The following article concerns counterfeit relics, and some of the history of Father Francis LeBlanc who operates Our Lady of the Sun International Shrine in El Mirage, Arizona WITHOUT the permission of the Bishop of Phoenix. (El Mirage, Arizona, is a suburb of the Mesa / Phoenix Area.) This post is not intended to cast slurs on Father LeBlanc, who may have always acted in good conscience. It simply presents some of his history. While Father LeBlanc does operate his Shrine without the permission of the Bishop of Phoenix, that Bishop - (at the time of this writing) - WILL NOT permit the Tridentine Indult Mass to be said anywhere within his diocese, even though the Tridentine Rite Mass, (called the 'Indult) has been expressly permitted by Rome. LeBlanc, who has always been a staunch Tridentine, began his career as a disaffected Tridentine priest, long BEFORE the Vatican itself permitted the Tridentine Indult Mass to be licitly performed. Fr. LeBlanc has been at odds with the Bishop of Phoenix since he took up residence there over 20 years ago. He does pray for the Bishop in every mass, even though he has not been granted faculties which permit him to licitly perform the Tridentine Rite Mass within that diocese. He just does it anyway. Sadly, LeBlanc may be partially to blame for the Bishop's hostility towards pious Catholics who might enjoy being able to occasionally attend to a Tridentine Rite Liturgy. Bishops should have faith that the majority of modern day Catholics are committed and devoted to the New Rite of the Mass. They will not flock to Tridentine liturgies, just because they are permitted to attend. Truly pious Catholics are committed to sanctifying the Church as it is today. They long to move forward. Many diocese's throughout the United States, and the world, do permit the most holy Tridentine Rite Liturgy - for those who may wish to attend this ancient, and revered liturgy. Therefore, the Bishop of Phoenix is considered by many Catholics to be a cause of dissension himself. He forbids the Vatican approved Tridentine Rite Indult Mass to be said within his diocese, though he allows many liturgical abuses, such as permitting laymen speak during the homily, (which is specifically part of the Sacred Liturgy of the Mass), and other things, which have been explicitly forbidden by Rome. Many of these dubious relics originally came with forged authenticating documents, which were actually altered Xerox photocopies of documents issued by the office of Nicolas Ferrante, Postulator General of the Redemptorists. 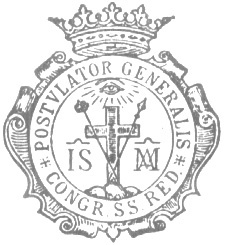 Postulator Ferrante's office had been in charge of the canonization of St. John Newman. Because the Center for the Cause of the Canonization of St. John Newman was based in Philadelphia PA, documents issued by Postulator Nicholas Ferrante authenticating the relics of St. John Newman were easy to come by in the mid 1970's. Those documents were then altered, usually by the removal of one of the lines in the document, allowing for two spaces - in which the various names of apostles, great saints, or other sacred objects, were written in by hand in Latin. Today, counterfeit papers may be made on ink jet, or laser printers. Customarily, documents of authenticity were printed on fine paper, using a printing press. Such old documents may be very fine in quality. "I got in touch years ago with the current Postulator General of the Redemptorists, Father Marrazzo, and he [verbally] assured me, and then wrote to me, that the relics I sent for his inspection could not come from Father Ferrante. Among other reasons, Father Ferrante never used the photocopy-based document..." Ferrante did not actually sign each document himself, so a lithograph reproduction of his signature does not indicate forgery. However, true Ferrante Documents may bear the name of the manufacturer of the paper of the document on the lower left hand side of the document, which may read: a.r.c.e.a. - roma - v. pigna, 18. Most certainly, black and white photocopies are false documents. This author fails to understand why so many counterfeit Ferrante documents fail to include the full signature of Father Ferrante. His full signature was certainly easy enough to obtain. Thomas W. Case is an expert on cults and a frequent contributor to Fidelity. It was question and answer time at the Tridentine Rite Conference's September 1992 conference in Chicago. The Rev. Robert Stemper, formerly a Jesuit and now of dubious faculties, was acting as master of ceremonies, bustling around the dias in his soutane, taking questions from the audience, which it must be admitted were slow in coming, spouting off various Latin phrases and generally praising the other panelists as those in the know, those who could put some reasonable order to the chaos which had engulfed the Church. With him on the dais were Father Nicholas Gruner, publisher of the Fatima Crusade also of dubious faculties, Father Paul Trinchard, who writes for The Wanderer. Michael Davies, apologist for the late Archbishop Marcel Lefebvre, who was excommunicated in 1988 after the illicit consecration of four bishops, and a certain Professor White, who was the least known and in many ways most interesting, an academic baby-boomer innocent who converted from Marxism to Christianity of some sort, but was prevented from telling his story by the officious Father Stemper, who had the unfortunate habit of encouraging people to talk and then shutting them up just when their stories got interesting. The TRC meeting was an attempt, one of many these days, to explain the chaos which has engulfed the Catholic Church during the past 25 years. People have become so desperate, so disoriented that they are willing to pay money to hear people like Father Gruner explain it all for them. And Father Gruner, to give him credit, does his best. Maybe it was all those Bo Gritz for President bumper stickers in the parking lot, but you know you are in strange company when Father Gruner is cast in the role of the moderate. "Just because the pope makes a mistake," he tells a young priest in a shiny black suit, doesn't mean he isn't the Pope." The crowd. it seems, doesn't know whether it agrees or not. One big issue at the TRC conference is sede vacantism, the doctrine which states that since a real Pope would never have let all these bad things happen to us, therefore the current Pope, and for that matter his three immediate predecessors, are, and were, not real Popes. The more things go wrong, the more the vacant seat explanation has appeal to people who are at a loss to explain things otherwise. Veronica Lueken, the seer at Bayside and a master at capitalizing on the fears and longings of the disaffected, even announced that Pope Paul VI had been kidnapped. One woman who was there that night and has come to have second thoughts about Veronica's visions described how the thrill of recognition swept through her busload of pilgrims as the explanation set in. Here. at last, was an explanation that made sense. The euphoria of sudden understanding spread through the crowd like a shot of morphine through the nervous system of a patient with terminal cancer. But that was then and this is now. The euphoria of the first shot of spiritual dope, taken right after the ravages of the Vatican council became apparent, is never duplicated by subsequent shots. And now 27 years down the road from the councils end the dosage keeps getting increased and the effect keeps diminishing. Gruner is no stranger to the calming effect of the all-encompassing explanation. For years he, waged a campaign against the Vatican claiming that the consecration of Russia called for by Our Lady of Fatima had not taken place in 1984. Thousands of letters were mailed to the Vatican demanding that the consecration be redone according to Gruner's specifications. Eduard Cardinal Gagnon's phone number was published in the Fatima Crusader, with the admonition to call and enlist him in this cause. The result was that the Cardinal was awakened so many times in the middle of the night by the weeping of hysterical women that he had to have his number changed. Gruner then alleged on the cover of his magazine that Gagnon agreed with him that the consecration hadn't taken place, a fact which Gagnon promptly and publicly denied, calling Gruner, among other things "a liar." And then, worst of all from Father Gruner's perspective, came the events of 1989 and 1991, the fall of the Berlin Wall, the failed Communist coup in Moscow and the disintegration of the Soviet Union. Now Father Gruner is forced to find other villains, or other explanations for the malaise we feel. Even though he still somewhat grudgingly refers to the "so-called fall of communism" in his talks, the fact remains that, one of the main conspiratorial causes has disappeared. Instead of rejoicing, there is simply more consternation. How do we explain the chaos in the Church now? The questions on the part of an increasingly bewildered laity keep coming and the number of groups which steps forward to answer them in the current authority vacuum in the Church increases apace. The TRC conference was a dramatic substantiation of the claim that nature abhors a vacuum. There will never, so a corollary of this law goes, be more bewildered people than there are groups who are willing to charge a fee to answer their questions. As Gruner drones on at the microphone, a lady wanders over to me and shows me, for some reason, a question she has written down on a small piece of paper. "What is the connection," she wonders, "between the NovusOrdo Missae [the mass promulgated after Vatican II] and the Novus Ordo Seclorum found on the dollar bill? Good question that. The answer which pops into my head almost immediately is that both are the result of Masonic conspiracy. That should be obvious from the common use of "Novus Ordo," which means "new order" in Latin. I do not give her this answer primarily because I don't believe it myself but consider it an ominous sign that I am caught up so readily in the spirit of the gathering. At a certain point people who should know better, people trained by the Jesuits long ago for example, start giving answers more for the effect they have on people than for the truth value of what they communicate. This is known as pandering and it is never easy to detect when there are so many crazy theories around but it is never far from the surface at gatherings like this. "According to the prophecies of Malachi this is the last Pope. How does this agree with the three days of the darkness and the chastisement predicted at Fatima?" For once, Father Stemper is at a loss. I really don't know he says. But then as if to direct the conversation back to familiar ground he criticizes "communist disinformation and infiltration of the media" evidently unaware of Father Gruner's reference to the so-called fall of communism. This is why you come to conferences like this he continued evidently unaware that he had not answered the question. To get your marbles together and get them in a straight line. Father Stemper may or may not have all of his marbles together but he is at least partially right here. The reason people come to the TRC convention is that they have been traumatized by the aftermath of the Council and live in a world which seemingly no one can explain in any cogent much less compelling fashion. The TRC is just one small contingent of a vast army of bewildered Catholics who have decided to vote with their feet. Marching beside them are the various phony apparition addicts, the supporters of fundamentalist televangelists and hordes of those who are just as alienated by reckless change but whose allegiance shifts with the moment. The TRC is the brainchild of Father Francis LeBlanc of Phoenix and Father John Quinn of Chicago though LeBlanc is said to be the dominant character of this pair. At the TRC's last convention in September 1991 in New Jersey, Fr. Paul Wickens was elected president and Fr. Robert Stemper vice-president. Fr. LeBlanc is not an officer at this time having for his own reasons withdrawn (at least publicly) from the organization. Regardless of the TRC's current leadership the LeBlanc\Quinn connection that gave birth to the TRC a few years deserves some scrutiny. The bizarre nature of the circumstances surrounding its birth make it noteworthy for that reason alone. Beyond that there is value in warning people away from something that can do them serious spiritual harm no matter how pious it seems at first glance. On August 6th, 1978, a few hours after the death of Pope Paul VI, a Spaniard by the name of Clemente Dominguez, who had been claiming to receive apparitions and locutions from the Blessed Virgin in the town of Palmar de Troya, declared himself Pope Gregory XVII, the first Marian pope. On the strength of anti-pope Clemente Dominguez mystical claims a Chicago area priest and two laymen traveled to Palmer de Troya Spain and eventually got themselves consecrated as bishops. There they met an English dwarf, Mrs. Patricia McElliot who like Pope Clemente heard voices too. Mrs. McElliot who had been living in Palmar de Troya took the three Chicagoans under her wing and began traveling with them back and forth between her new Marian order in Italy and the bogus Marian Shrine at Necedah Wisconsin. Necedah is the site of a 42-year old cult built up around a false apparition every bit as blasphemous as Bayside. A typical locution allegedly from Our Lady as strained through the mind of Necedah seer Mary Ann van Hoof would consist of fifteen minutes of shouted diatribe against the Godless Supreme Grand Master the Black Pope. (She meant Pope Paul VI.) The shrine and its supporters were placed under an interdict whereupon Mary Ann affiliated the cult in 1979 to the Old Catholics. And so the cult of Necedah remains condemned locally and by Rome; all Catholics are forbidden to support it in any way under pain of excommunication; nevertheless drawing to its web a crowd of disaffected and disobedient Catholics of every stripe. It is interesting to note that Mrs. McElliot's voices took her and the priests under her influence to such a disreputable Catholic sideshow. Fr. John Quinn was one of those priests. One night in 1981 he visited Necedah and was consecrated there by Clemente bishops Maurice Revaz, William Daly and the former layman Richard Corr. "Bishops" Corr and Daly are two of those who had gone to Palmar de Troya from the Chicago area some years previously and had become entranced by Mrs. McElliot's voices. In 1982 less than a year later those same (or different?) voices told Mrs. McElliot to return to the Church. Richard Corr was laicized and Fr. Daly died in 1982 after being regularized. These two men along with the English seer apparently came out from under the spell they had been under but John Quinn remains a bishop technically under the jurisdiction of the Anti-Pope Gregory XVII. As "Fr. Quinn," he hosted the September convention of the Tridentine Rite Conference. A Priests for Tradition meeting a precursor of the TRC -- took place in Chicago at a Howard Johnson s motor lodge in late 1985. Hosted by Fathers Quinn and LeBlanc the convention drew about twenty-five priests. It would be enlightening to run down the whole list to show the length and breath of the motley crew in attendance. We will identify only a few to give a taste of things to come. Fr. Fred Nelson of the Powers Lake, N.D. traditional Marian shrine was there. Fr. Leonard Giardina. O.S.B. came from Alabama and Fr. Daniel Jones from Colorado. And then there was Archbishop Zaboroski of the Mariavite Church. An offshoot of the Old Catholics, the Mariavites were originally a Polish sect whose priests and nuns joined together in mystic marriages to produce immaculately conceived offspring for the Final Age. Father Wathen of the counterfeit Order of St. John attended and Fr. Fouhy an independent priest who now resides at Mount St. Michael in Spokane, Washington, and Fr. Joseph Vida Elmer who in 1987 became Bishop Elmer (by way of Robert McKenna through Guerard des Lauriers out of Ngo-dinh-Thuc.) The cult at Mount St. Michael and the schismatic Thuc lineage will be described later. The show moved to Phoenix the following year when the Tridentine Rite Conference was formally instituted under the direction of Fr. Francis LeBlanc. Who is Fr. Francis LeBlanc? He apparently received his priestly orders in Canada. He spent years in the paratroopers as a military chaplain. At what time he conceived a dislike for the Conciliar Church is not known. He tried to become incardinated in a diocese in Los Angeles but was refused. He spent the next 20 or 15 years going from place to place in California saying the Tridentine Mass for small groups of disaffected Catholics. Sometime in the late 1970s he came to Phoenix and according to Lefebvrite Fr. Finnegan tried to horn in on Finnegan's scene there. Eventually LeBlanc gathered a flock for himself and established a church with the aid of a munificent lay benefactor. LeBlanc was never actually made president of the TRC. The first was Msgr. Rucsitto (a California priest whose faculties had been suspended for saying the old Mass without permission) then Fr. Stemper and now Fr. Paul Wickens. LeBlanc remains a power behind the scenes though for public relations reasons he claims to be out of the TRC entirely. Fr. Robert Stemper. formerly president and now vice-president of the TRC was originally a Jesuit. He is a confederate of Fr. LeBlanc and now has his own parish of irregular Catholics in Mesa, Arizona. Early on he taught at the Jesuit University in Tokyo. Later he was an assistant pastor in Madison, Wisconsin. In the early 1980s he resided at the Shrine of Our Lady of the Prairies at Powers Lake, N.D. a conservative Catholic compound (the Tridentine Mass was said there) which was under the direction of the now deceased Fr. Nelson. On at least one occasion a couple of years ago Stemper visited the place of the phony apparitions in Necedah. He was then in the company of Father "X" a reputed prophet who advertises himself as the true seer for Necedah and Bayside -- thrilling mystic credentials indeed. Father "X" is actually Gary McLaughlin, a gentleman who was convicted of mail fraud and impersonating a priest in New Mexico in 1987. "The Great Pontiff of the future shall be an American and come from the Shrine in North Dakota. I see the Pontiff and I am amazed. He rules the Church with the tenderness of a Shepherd and the iron rod and smites the enemies of Church with his breath.... Oh! It is horrible. I now see the destruction of those seers and laity who refuse to unite with this Shrine. I see the Bishops and Cardinals and Priests being executed in the Chastisement. I see Veronica Leuken [the seer of Bayside] in a turmoil, Satan buffeting her for a small space. I now see Veronica saying: "Yes Father McLaughlin is the future Pontiff. . . obey only Seers that are united with Orrin, ND and Bayside. I am in union... total union with you Father and you shall lead all Seers worldwide." Fr. Stemper's association with this Great Pontiff-to-be and his involvement with the cult at Necedah might make one wonder a bit about his judgment if not his religious sanity. Fr. Paul Wickens seems to be the most energetic promoter of the TRC. He visits Richard Williamson (the Lefebvrite bishop of North America) in Winona, Minnesota; Williamson has performed confirmations on children at Wickens traditionalist chapel in New Jersey. Wickens also gives sermons to the Sectarians at Mount St. Michael, visits Fr. Dan Jones independent Catholic chapel in Westcliffe, Colorado and is often in the company of Leonard Messineo, Grand Master of one of the factions that make up the scurrilous (Shickshinny) Order of St. John. The articles in Sangre de Christo presenting Giuffré's Siri Theory are a fantasia of wish-it-were-so. The underlying assumption is that since the Vatican II popes are false popes a real pope must have been elected and then through some conspiratorial treachery was denied the papacy. The treachery must somehow have occurred within the Conclaves that ended up electing the "false Popes" John XXIII and Paul VI (or Paul VI and John Paul II). Since Giuseppe Siri represented the traditional Church for many (he died recently) he becomes the obvious candidate for an alternate papacy. None of this is explained in the articles. The proof in the articles of Siri's true papacy is the fact that in 1958 when a Mass was held in a circus arena before a great crowd of the faithful in Genoa a flock of pigeons was released: and one of these pigeons (or doves reasons Giuffré) landed atop the blessed head of the presiding bishop Cardinal Siri. The symbolic descent of the Holy Ghost verified Gods intention. Siri was obviously destined to be the next pope. Another proof is based on a prediction from the Lafayette apparition that "the Holy Father would suffer greatly.... The wicked will make several attempts on his life...." Giuffré applies this prediction to the "true Pope" Siri who he says endured 33 years of exile from the papacy as well as constant blackmail and threats and was possibly murdered. This is fabulous history. In real history it is Pope John Paul II who was shot in Rome and nearly knifed at Fatima a year later. Of course Pope Siri would never have called the Council, the modernist horrors would never have taken place and the Church would have remained in the pristine state it enjoyed in 1958. But all is not lost. The word has gone out from the Giuffré camp for the cardinals secretly consecrated by Siri to come out of hiding now and take their place in the sun. To gather together that is and hold a Conclave to elect a true pope and thus return the Church to the succession and make It once again One and Holy and Catholic. Why dignify this fairy tale with the retelling? Because it demonstrates the lengths some people will go to resolve what seems an unsolvable problem. John XXIII a tool of the Illuminate? (Why else call the Council?) Paul VI a secret Mason? (Why else let Archbishop Bugnini ruin the Mass?) Siri not elected pope? There must have been a plot! It's been some time since we talked on the phone, and I wasn't sure how your ideas might have evolved by this time, yet I was still surprised to see that you had disseminated the old Thomas Case attack piece against me, without giving me a chance to answer his objections first. It seems that Case, trashed me with all the others who are included in the mixed bag known as "traditional Catholics" (even though I have nothing to do with any of the alphabet soup groups) simply because I will not pay homage at the altar of his false god, JP2. I say, false god, because that is what this hideous characature (sic) of a "pope" has become to people like Case, since they obviously accept his word over all the true Popes of past centuries, and even Christ Himself. As I recall, when I talked to you about my investigation into the post-Pacelli conclaves, at which Giuseppe Siri was repeatedly elected but overthrown each time by the Masonic super-powers, while his office was usurped by enemy agents, you indicated no objection to my thesis but seemed to agree that this was, at least, a possible answer to the horrendous Church crisis since the death of Pope Pius XII. Now you place yourself squarely in the camp of Case, who employs ridicule rather than to respond to my material as a whole, by twisting my preliminary comments made in an introductory article, before any of my documentation is presented. Have you, or Case, or any of your ilk ever spoken with any former Vatican officials or secretaries of the cardinals regarding the anomalies that surrounded the recent conclaves? Did you know, for instance, that Milan's Corriere della Sera revealed on their front page, for 28 October 1958, that a high Vatican official inside the conclave confirmed that a new Pope was elected and accepted office on 26 October, two days before Angelo Roncalli was seen on the papal balcony? Have you ever been to Rome to check the public documents that pertain to those hidden events that deprived the Church of her rightful shepherd? Well, I have. And until you and Case have done a little checking into these issues on your own, perhaps you should reconsider the wisdom and justice of tarring a fellow Catholic with your broad brush, over subjects about which you know absolutely nothing. I have been in this fight since the first week in January 1961. Although probably not much older than you, I challenged my pastor back then, when he glibly announced that the Confiteor, Misereatur, and Indulgentiam would no longer be recited before the Communion in the Mass. When that first change mushroomed over the next 9 years into a total revamp of the irreformable, untouchable, Holy Sacrifice of the Mass, my family and I organized with other Catholics in Houston to expose and oppose what was in reality the illegal suppression of the true Mass by the enemies of the Church within and without its physical structures (see Newsweek, 4 February 1974, page 56). From the beginning, we relied upon the services of valid, senior clergy ordained by the Church when it WAS the Church. In 1976, our group was one of the first to uncover the duplicity of the cunning SSPX, and to warn other lay associations around the country that the Lefebvrists were agents of the "phony opposition." We were already into the investigation surrounding the violation of the conclaves, before you had a clue that something had gone wrong at your local parish. Without any careful study of the issue, you jumped right into the trap they set for you. Then, when you got burned by the SSPX, you ran right back into the loving embrace of the same criminal agents who took away the Mass in the first place, once they offered you a few pathetic crumbs they euphemistically call "Ecclesia Dei" and the "indult." You are a "Johnny-come-lately," Bill, - a "babe in the woods." You think that the problem with the "traditionalists" is that "they left the Church." You don't have the slightest idea what your talking about and have no business putting out your hodge-podge, which is laced with some truth, half-truths, and outright falsehoods. You have neither the sense nor Catholic education to know the difference. Consider this as a strong dose of "fraternal correction." You ought to close down your whole operation and go "back to school" and learn the Catholic Faith. Begin by locating and reading the documents of all the General Councils of the Church. If you knew what they taught, you would know that the "conciliar church" cannot be the true Catholic Church founded by Christ. This can be assertained without any reference to the violated conclaves. Conversely, if you accept the documents of Vatican II, then you must necessarily reject the definitions of past true Popes. You can't have it both ways. Think twice before you spread your ignorance around to those even more ignorant than you. There will be hell to pay for leading others into error. "Affected ignorance," as St. Thomas described it, will be no excuse come Judgment Day. Read also the annotations of the eminent English Fathers of the Church who translated the Latin Vulgate into the original Catholic Bible in English, from which was published the Duoay-Rheims (sic) New Testament in 1582 (not to be confused with the truncated Challoner version) . In their commentaries, the learned fathers explain, over and over again, the prophetic texts of the Bible, that refer to the latter days, as a culmination of three frightful events in succession: First, the usurpation of the Chair of Peter by Antichrist; secondly, the banishment from Rome of the rightful Pope; finally, the abolition of the Holy Sacrifice of the Mass - in that order. If somehow, you can muster the capacity to inform yourself, but do not rejoin the true Church, remaining instead with its persecutors who have driven it "underground," you will be no better than the insidious SSPX which you claim to oppose. Then may God have mercy on you, and all who are so blind as to follow you.